Since my old keyboard does not work properly anymore, a replacement was neccessary. 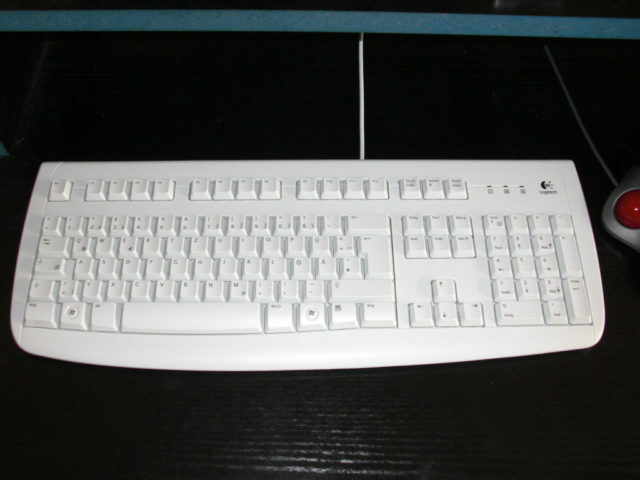 I’ve choosen a cheap model by Logitech – “Deluxe 250” – with PS/2 connection, which I use in the USB variant on a daily basis in the office. It also seems, Logitech favours this model as OEM stuff for hardware manufacturers – because officially you don’t find this keyboard on the Logitech homepage. The finish suits the low price of about 10-15 EUR. The housing is not very rigid and the keyboard did not lie planar on my desk in the beginning, since it was a bit skewed. A courageous grip to straighten the housing could solve this problem easy. Apart from that, writing on the keyboard is very comfortable. One thing, which I really like is the fact that the first row with the space key is a bit broader and rounded. Compared to the price it is really recommendable.